The Chicago skyline with the Imagine Project. Chicago is a city of neighborhoods, and Michael Reese will follow the city scale model that has been working for over one hundred years. This city beautiful plan, an icon of city design, ensures that all outer neighborhoods radiate toward the downtown loop and that upland neighborhoods have access to the lake. State Street, Lakeshore Drive and the transit system connect this site to downtown. 26th Street, 29th Street, 31st Street and Stevenson Expressway will enhance lakefront access to the upland neighborhoods in the future. This proposal goes beyond the Michael Reese site and includes a number of “soft” and “opportunity” sites in the area. This reinforces the notion that the impact of this plan goes beyond its property lines. State Street is the city street that connects the area to every other place. Martin Luther King will be rebuilt to echo the character of the Bronzeville neighborhood’s Main Street, with low rise buildings and active retail. 31st Street will make the approach to the lake in a more gracious manner through a series of neighborhood parks, some existing some new, that redefine the corridor. Three neighborhood streets, 26th and 29th from the IIT area and Rhodes Avenue from Bronzeville lead directly to the new transit station. The Transit Hall ties to the Lakefront Terraces and also bridge over Lakeshore Drive to a newly renovated Landing in the park on the lakefront, yet another special place. 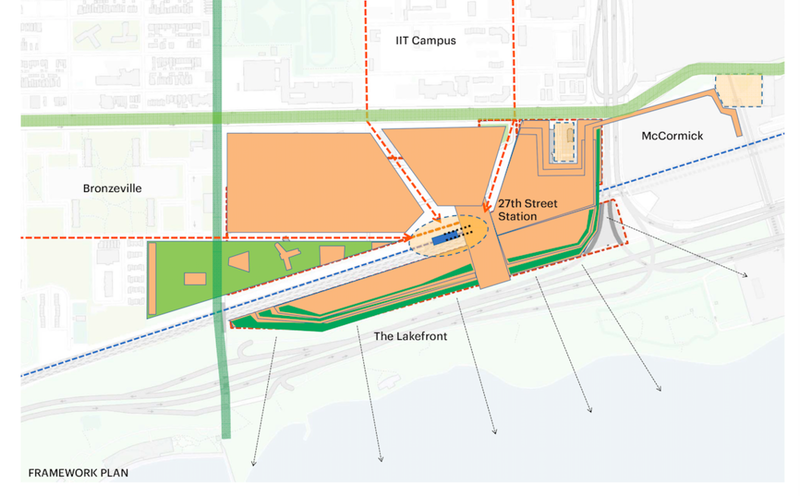 Chicago Metra and "L" Train Access for The Michael Reese Site. The Black line is a proposed expansion line for the "L"
Diagram of the Michael Reese Site as well as well as potential future development locations. The map shows the size of each lot by square foot and acre. The urban design for this plan starts by reinforcing the four different surrounding edges. 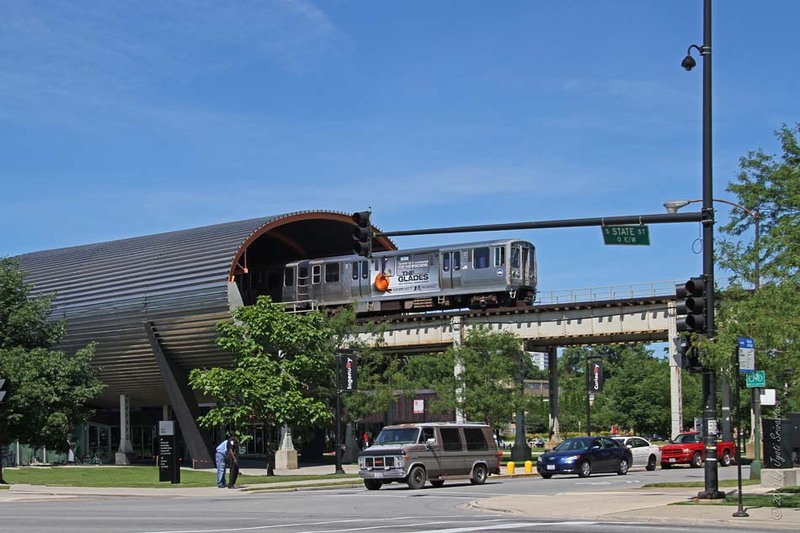 Seamless connections to Bronzeville, IIT, McCormick Place and the Lakefront organize the composition. The site is designed in the manner of a typical Chicago neighborhood. The streets lead to transit and the lakefront. Development is mixed use with a variety of building heights, the tallest at the lake and the lowest next to Bronzeville. The character of the plan is determined by the network of streets and parks which blend the site into the surroundings, the property lines will be blurred when the plan is completed. This is a plan that carefully integrates buildings, open spaces and streets into a crafted Chicago neighborhood. 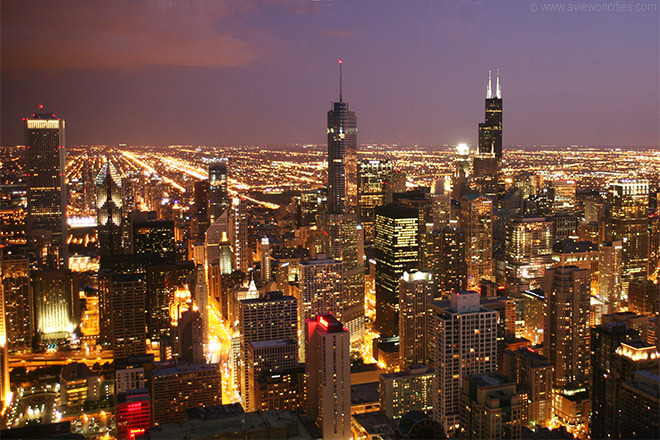 There is balance between these three key elements and the composition is all about Chicago. A variety of small, medium and large parks combine to provide over 30 acres of new parkland in this plan. The parks vary from a small park across the street from a neighborhood church, to a modern quadrangle for the tech campus, a hardscaped plaza at the transit station, a large cultural park that keeps the original hospital building and adds neighborhood culture into the mix, and finally a series of lakefront terraces that rise and tumble for 60 feet in height to create a unique lakefront experience. The streets define the character of the neighborhood and the pattern illustrates how four different areas work together to form a singular place. 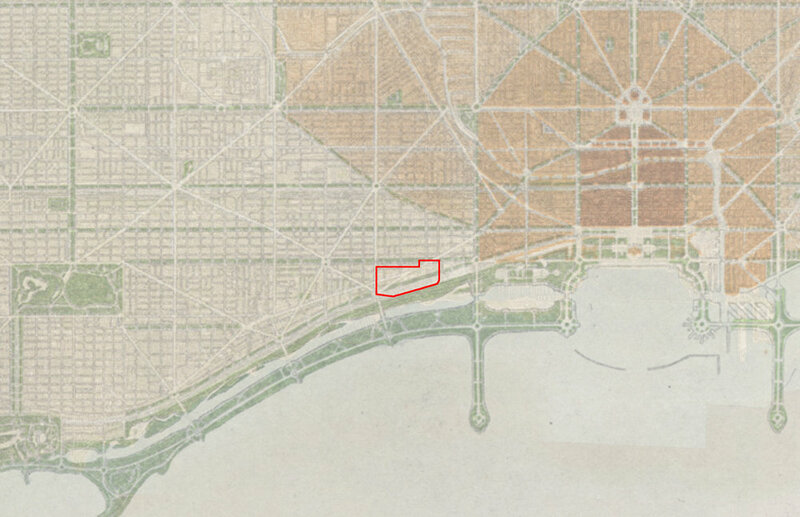 The Bronzeville neighborhood grid is reflected as an extension into the plan. The campus is framed with streets but protective of the pedestrian quadrangle at its center. The entertainment area sits on top of parking. The lakefront parcels fulfill many functions from staging for 1000 trucks and 4000 cars for the convention center, and providing 2000 cars for the tall residential towers on the lake. There is also potential for park and ride and easy pedestrian access to the Transit Hall and trains. The pattern of development comes from the mixed use program. The neighborhood residential are arranged as classic courtyard blocks. The campus is composed of figural buildings around the Quad. The entertainment and hotel block have an atrium as the defining element, in the same manner that the full block for Marshall Field Department Store was designed long ago. 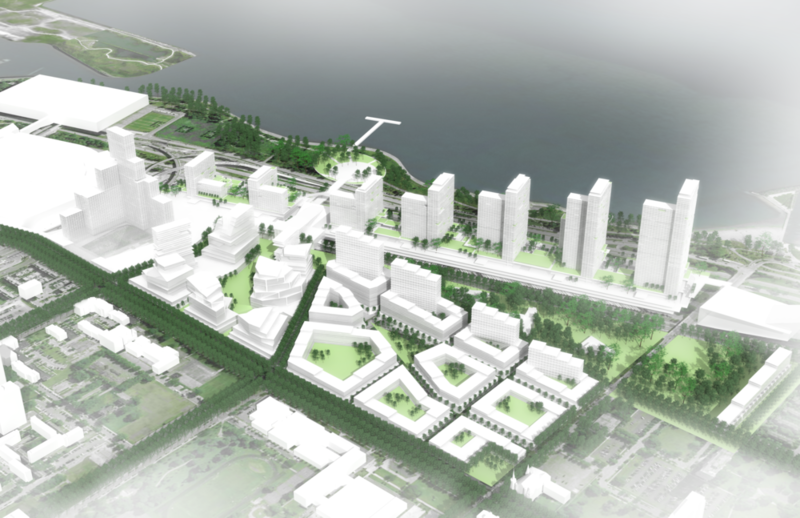 The Lakefront Towers and Transit Hall are massed to form an enduring and large image. Free and easy movement within the Michael Reese site and between the surrounding neighborhoods is evident in the plan. The site ties together Street Level (+0’) with Concourse Level (+20’) through the Transit Hall and Plaza, to Terrace Levels (+40’ - +60’). Lateral and vertical movement is achieved through sloping streets, ramps, terraces and atrium to create surprise and delight as one moves to and through from neighborhood to campus to convention center to the lakefront. In this image, you see in yellow access pathways between the Metra Station Transit Hub, through the Imagine Entertainment Complex, and then across to McCormick Place. 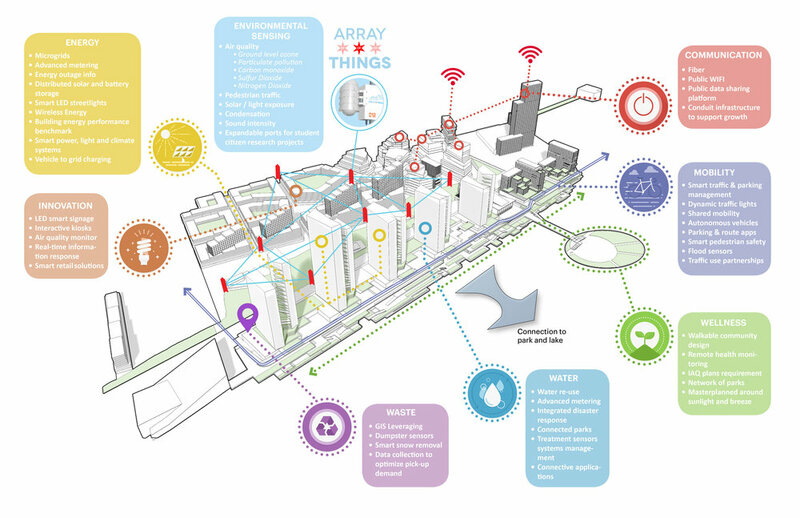 This ease of access allows for strong integration between several of the plan's proposed elements, while leveraging the growth potentials McCormick Place provides. These cross sections show how the various levels are interconnected but located to solve individual functional problems. The basic street level of MLK, IIT, Bronzeville and the railroad tracks. The basic level transit riders must rise to cross the tracks and move about. The Transit Plaza is a t this elevation to make access clear and easy and allows for parking below the Plaza. Further, the truck staging yards require nominal 20’ clearance and this aligns with the transit level. Is the height need to cross the freeway with a pedestrian connection to McCormick Place. And the 4000 cars needed to support McCormick are on two levels over the truck marshaling and that elevation aligns with the Convention Connection. Is the top of the parking required for the lakefront residential, on two levels over the convention parking. The Terraces alottng the lakefront step, ramp and descend from the upper to the lower levels and everything connects to the public realm at the lake.